Bigfootman's Review Blog: A Nancy Drew Files Mystery Solved? A Nancy Drew Files Mystery Solved? However, one LinkedIn page not only revealed the name of a ghostwriter, but might have solved a mystery as well. But first, some background info. 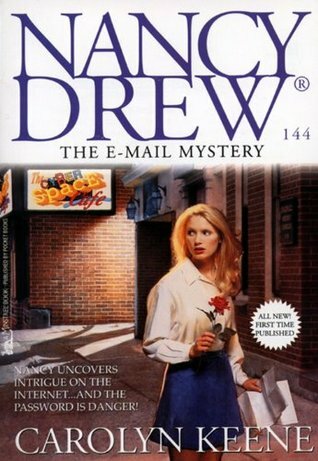 The final book in the Nancy Drew Files series, "Crime at the Chat Cafe" was published on December 1st, 1997. However, that may have not been the last book written for the series. The Book Depository had a listing and an ISBN number for Nancy Drew Files #128, before the listing was removed. * They also had listings for other unpublished Hardy Boys and Nancy Drew books, like Casefiles #129, 131-134 and Super Mystery #38. What the Book Depository didn't have were ISBN numbers for Nancy Drew Files #125-127. Now, you'll notice that I didn't list Casefiles #130 as one of the unpublished books. That's because it actually got published as Digest #150, "The Crisscross Crime". If you were to search the Book Depository for "Casefiles #130", back when the site still listed unpublished books, you'd find nothing. So where were the ISBN numbers for Nancy Drew Files #125-127? I have long suspected that those three Nancy Drew Files books got published as Nancy Drew Digests. However, I've never been able to figure out exactly Digests started out as Files books. In the experience section, she lists some of the books she's written. Now this is where it gets interesting. One of the entries on her list is, "The E-Mail Mystery, Nancy Drew Files (Megabooks; Simon & Schuster)". This is strange, because "The E-Mail Mystery" is actually Digest #144. However, Denise Hidalgo referred to it as a Nancy Drew Files book. Considering that she wrote the book, I don't think this was an error. Now I haven't read "The E-Mail Mystery", but the summery on the back cover makes it sound a lot like a Nancy Drew Files book. I'm pretty sure that the "The E-Mail Mystery" is one of the three missing Files books (#125-127). *For those wondering, the ISBN number for Nancy Drew Files #128 is 9780671007553. Great detective work! I too tried to pull up author info this way, but only found the author of the Nancy Drew Diaries book. Very interesting about The E-mail Mystery. I'm sure Wild Cat Crime was another (I think Brenda Carlton was in this title as well) and Case of Capitol Intrigue. I believe Elizabeth Nugent was the author of Capitol Inrigue (as well as Mystery in Maui). Would love to reach out to her and find out if she remembers how these were to be published. Another potential Files book published in the Digest Nancy Drew series is Case of the Captured Queen. I never noticed before, but starting in 1998 all the Digest titles were probably written as Files! Review: "Smithsonian Institution: Dinosaur Museum"